Today brings not just one but two interviews with Phil Klemmer, a writer on all five seasons of Chuck, and all four seasons of Veronica Mars. We also launch the new “Video Tips” segment of the podcast, and welcome a number of new sponsors. Based on a Six Feet Under spec script that Phil wrote in two weeks, Rob hired him to write on Veronica Mars, a job that would last four seasons. After Veronica Mars, Phil got a job on NBC’s Chuck, a show that has always been on the bubble for renewal. After the third season, renewal news came late, and most of the Chuck writers, including Phil, took jobs on other shows. Phil describes what it was like to work on NBC’s Undercovers, a show that he says was doomed even before it aired, and then how he fortuitously returned to Chuck mid-season, immediately after Undercovers was cancelled. Then Klemmer talks about the present, sharing how the cast and crew of Chuck are gelling like never before, but are already nostalgic about the end, as Chuck wraps up production for good on December 7th. In the Video Tips section, Gray talks about how easy it is to add custom color looks to your showcase film or webisodes using Red Giant Software’s Magic Bullet Suite. Buy Gray’s book for only $4.99! 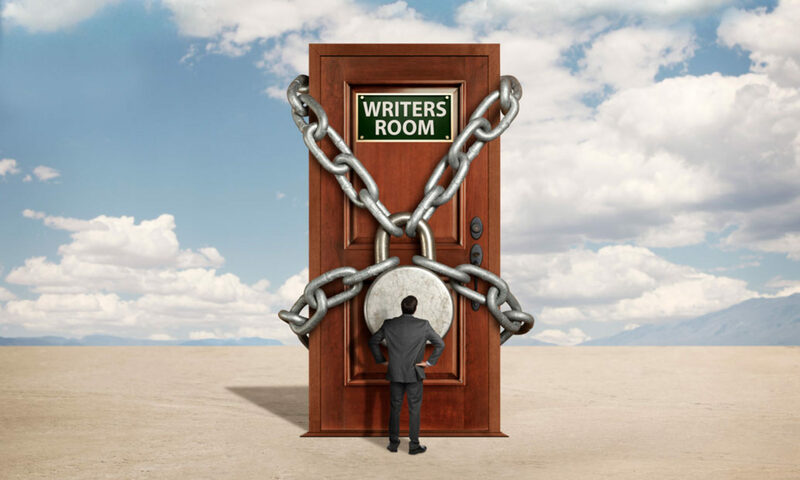 Look for it on Amazon – How To Break In To TV Writing: Insider Interviews. Didn’t get your questions asked? Make sure you follow Gray on Twitter (@GrayJones) so you can get the scoop on who is being interviewed and how to get your questions in. Also check out our TV Writer Twitter Database to find Twitter addresses for over 1,000 TV writers. Find our previous episodes and other resources at www.tvwriterpodcast.com or on Gray’s YouTube channel. He was born on the first day of the Great Depression, did competitive ski racing in Europe, and went to spy school to become a special agent. But a passion for writing led Eric Kaldor to Hollywood, and he has many stories to tell about his journey! After spending some time as a sports producer, Eric Kaldor landed his first TV writing gig. He then went on to write for some of the most well known hits of the 1970s: Emergency, Kojak, The Rockford Files, and The Incredible Hulk. You’ll love hearing about how TV writing worked in the 1970s, and how much it differs from the group writing of today. Also, Eric is full of amusing anecdotes about his path to and through Hollywood. After 1980, Eric left TV writing to raise his family and build a successful family business with his wife. He started acting, and has had parts in films, like 2006’s Hollywoodland, and many recent shows, including ER and House. Eric never stopped writing … he is currently working on a novel, and publishing it a chapter at a time on his website at erickaldor.com. Comedy writer Kristin Newman spent almost 10 years writing on very well-known comedies, and had her own pilot shot and picked up to series (though not aired). She now brings her talents to a one-hour drama, on NBC’s Chuck. Kristin Newman got an early break, with a production staff job on Everybody Loves Raymond. She graduated to writer’s assistant on Nikita, Mad About You, and That 70s Show. She ended up stuck in the 70s (in a good way!) for the next seven years, rising up from staff writer to supervising producer. Moving on to How I Met Your Mother as co-executive producer, she also landed an overall deal at Fox … which was unfortunately cut short when the 2007 writers strike happened. Because of an injury, Kristin was not able to walk the picket lines. What could she do? She wrote the pilot Single With Parents, which was shot with Alyssa Milano and Beau Bridges, and picked up to series … though it unfortunately never aired. Then came NBC’s Chuck. She entered the staff as co-executive producer in its fourth season, and is currently breaking the series finale. Make sure to watch the final season, when Chuck returns on Friday, October 28th! This week we hear from another animation writer / story editor. Christopher Yost has been working on animated TV series, comics, and features for almost 10 years, for well-known Marvel and D.C. franchises. After a number of years as an advertising producer in Detroit, Michigan, Christopher Yost decided he needed to make the jump to Hollywood. He attended the Peter Stark Producing program at USC, but realized while there that writing was really his passion. An internship at Marvel Studios led to his first break, writing a script for Marvel’s animated property X-Men: Evolution. Soon he was writing such well-known titles as D.C.’s The Batman and Teenage Mutant Ninja Turtles, and eventually became head writer and story editor on Fantastic Four, Iron Man: Armored Adventures, and The Avengers: Earth’s Mightiest Heroes. During this time he also wrote two animated DVD features, Next Avengers: Heroes of Tomorrow, and Hulk vs. Wolverine. Yost also works in comic books, writing for Marvel’s X-Men and Spider-Man franchises, DC’s Batman franchise, and the adaptation of the sci-fi classic Ender’s Game. His first creator-owned original graphic novel Killer of Demons debuted in March of 2009 to critical acclaim. Yost is currently working in the Marvel Writers Program, helping develop potential live-action feature properties for Marvel Studios as well as handling additional writing and reshoot scenes for the Marvel Studios film Thor. Animation writer/creative producer/story editor David Dias was a hit on the TV Writer Chat several weeks ago, and is back for a one hour interview discussing all the ins and outs of writing animation for all ages, including many great tips on breaking in, pitching, and getting your idea off the ground. After a BFA in film production from York University in Toronto, David started assistant editing at Nelvana, one of the biggest animation companies in Canada. He soon realized that he wanted to write, and landed a job on an in-house writing staff. For the next five years, he wrote for a large variety of shows, before becoming an independent writer-producer. David has credits on over 40 animated shows from the mid-1990’s to the present, including such well known titles as Franklin, The Berenstain Bears, Doodlebops, Caillou, The Cat in the Hat Knows a Lot About That, Magi-Nation, Max & Ruby, and Redekai: Conquer the Kairu. Breaking the usual chronological interview format, Gray and David spend almost a full hour talking about all aspects of animation writing, including how to know which companies are accepting open pitches, what you need to be able to pitch, how the quality of art can make or break a pitch, how to land an artist without having to pay up front, and much more! Ever heard of someone who didn’t live in L.A. or New York landing a staff TV writing gig? How about sight unseen, hired from a phone interview? Meet Mike Alber, who sold many pitches to a major network, wrote on a web series, and even landed a staff writing gig while not even living in the same state! Mike & writing partner Gabe Snyder met in high school, and clicked right away. Despite going to different colleges in different cities, they wrote together constantly. Mike was on track to be a doctor, but after starting med school he realized that writing was his passion, so he switched his masters studies to creative writing. Gabe moved to L.A. in 2006, but Mike continued his studies in Ohio. They placed in several screenplay competitions, but it was through an honorable mention at a trackingb.com contest that they got their first option. They were on the map! One relationship led to another, and soon they sold several pitches to Spike TV, worked on the web series Ultradome, signed for management and representation, and were taking meetings all over town. Mike tells the amazing story of how his newborn daughter kept him away from L.A., yet he was able to land his first TV staff gig, on MTV’s Death Valley, with a phone call from the hospital waiting room! Mike finally did move to L.A. this year, and does advise that everyone else should move to L.A. first — his luck is not easy to repeat! Mike and Gabe are idea machines, and Mike has great advice on how you can be one too! To find out how you can advertise your product here on the site or on the podcast, send an email to mail@tvwriterpodcast.com! Kurt Sutter's "Show Must Be Run"
What to Spec in 2011? WGA "Writing for Episodic TV"